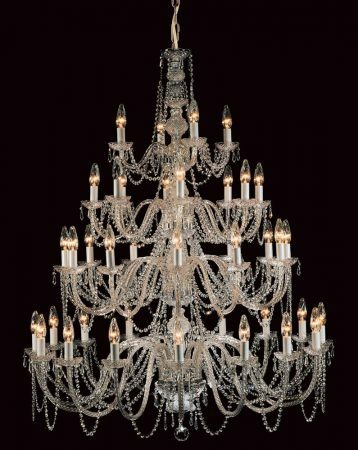 This Impex Modra very large 40 light Georgian style chandelier with Strass crystal detail features polished chrome ceiling mount, chain suspension and frame, with a cut glass encased central baluster and grand waterfall of forty double curved swan neck barley twist arms and candle style lights cascading downwards over four tiers; the lower tier has sixteen, the second has twelve, the third has eight and the top tier features four. Each arm boasts cut glass sconces, candle style lights, Strass crystal drops and white candle tubes. The whole chandelier is draped in highest quality strung Strass crystal beads to create a stunning feature. From the luxury lighting collection, a spectacular feature Strass crystal chandelier, with style, quality and impeccable detail. Capture the dazzling ambience of the Luxury collection in any space whilst adding a focal point to any double height space, hallway or stairwell. 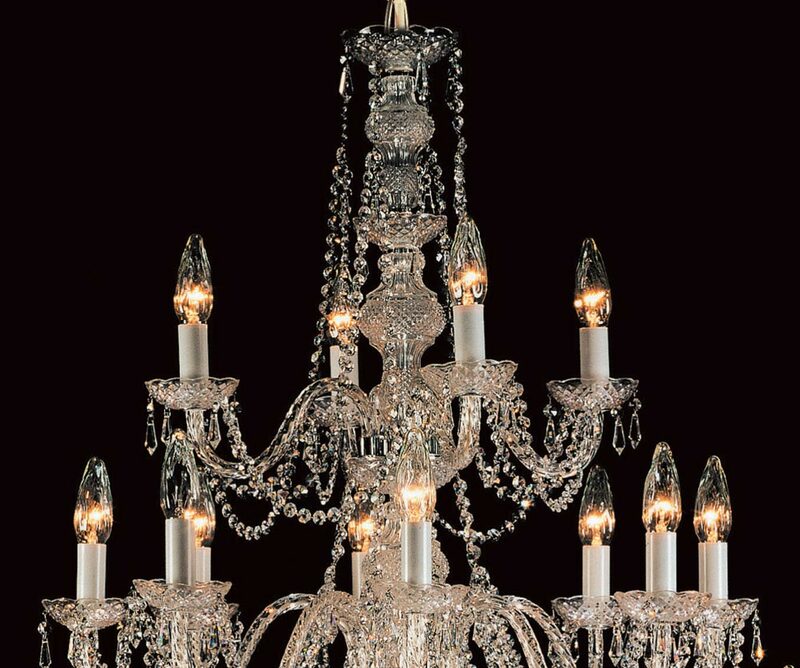 This large scale Georgian style crystal fitting is a sparkling addition to any home with enough space. The classic style mixed with chrome, glass and crystal makes it suitable for most décors, ranging from traditional, period and classic, right through to more contemporary settings. A magnificent centrepiece chandelier that certainly has the wow factor and will require a very large space. Please note: This is a very large chandelier that is 154cm tall, has a diameter of 124cm, weighs 42kg and will require careful installation and a large space to be shown at its best. Please check that this fitting is suitable prior to purchase. The height given below is for the fitting only, which is supplied with 50cm of chain but can be supplied with any length. Please contact us for this option. Shown here with polished chrome metal work and also available finished in polished gold (CP06033/40/G), although there is no image available at this time. Please contact us to enquire about this finish. The Modra luxury collection includes a variety of different sized chandeliers and double wall light that can be viewed below. 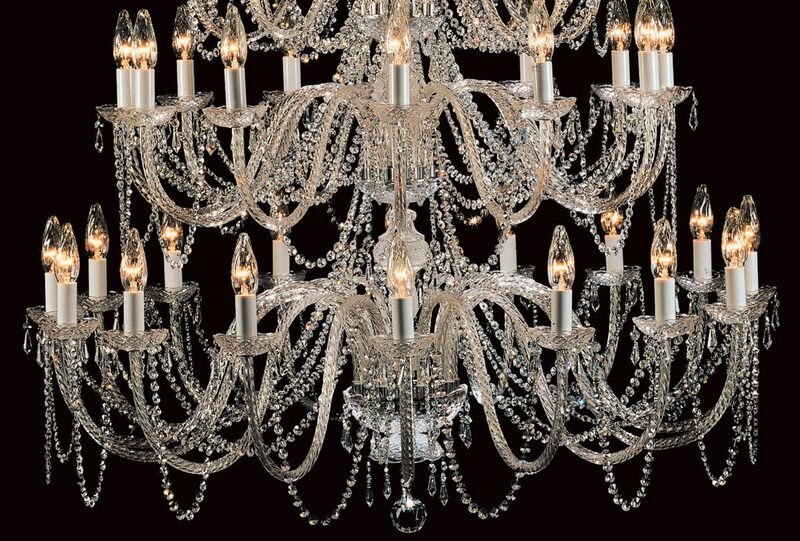 Impex Lighting are one of Europe’s leading manufacturers who supply a comprehensive ranges of fittings in traditional, contemporary and classic styles like the Modra very large 40 light Georgian style chandelier with Strass crystal detail featured here.